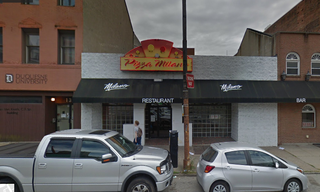 Video footage surfaced Friday evening of a black woman inside Pizza Milano—a popular Pittsburgh-area pizza chain— being pushed, restrained, head-butted and tackled by a manager of the store, who then, while on top of her, slammed her head repeatedly into the floor. Equally disturbing is that Pizza Milano appeared to be busy—with numerous workers and customers (including the person taking the video)—and no one intervened until after the woman’s head was smashed into the floor. Of course, some people will look at this video and see that the manager was merely trying to contain a customer who was belligerent and might have been intoxicated, and question why this is a “race” thing. These people are dumb.